Message from the Chief Sioux Fall Fire Rescue is committed to protecting the people and property of our community from hazards and emergencies through education, risk reduction, and emergency response. 	Provide professional development for SFFR’s members. 	Maximize efficiencies through leveraging technology to meet expectations. from several months down to a few days. vision, and value statements for the department to better align with new leadership and membership input. 	Foster an inclusive culture in all we do. 	Enhance community risk reduction. 	Promote health and safety. 	Sustain emergency response and prepare for community needs. SFFR implemented Pit Crew CPR (Cardio Pulmonary Resuscitation) to improve its efficiencies and effectiveness of CPR during a sudden cardiac arrest. Additional medical skills and devices included the addition of i-Gel supraglottic airways, Epinephrine auto-Injectors to reverse the symptoms of an allergic reaction and the administration of Naloxone (Narcan™) to reverse the effects of an opioid overdose. Implementation of New Fire and EMS Reporting Software—Through implementation of the Zoll Fire and EMS record management system software, this allows SFFR to more accurately document and complete EMS and fire incident/investigation reports more efficiently. The implementation will improve the ability to analyze key data points and build risk analysis across the City. stress and all other stressors triggered by work and life. partner with all divisions to meet the mission of the fire department. These include promotional and hiring processes, accreditation, ISO, department budgeting, purchasing, facilities maintenance, fleet apparatus and their maintenance, grants, contracts, and agreement oversight. ADMINISTRATION With 208 positions within Sioux Falls Fire Rescue, Administration was busy working with support services such as Human Resources to ensure the hiring and promotions of qualified individuals in order to meet the demands of a growing community. for Fire apparatus repair as well as response, many trucks and other equipment pass through that location, and with that activity comes the need for parking lot attention, so in 2017 new concrete was put in place. The fuel system at Station 7, one of only two co-located at fire facilities, was aging, and a decision had to be made on replace or remove, and with the assistance and working with support services departments, such as Fleet, it was decided that fiscally it was appropriate to remove. Other alternative fueling sites to meet emergency fueling needs were identified for that removal, which include utilizing Fleet fueling sites and the remaining SFFR Station 3 fueling site. Teamwork is the key to success, and the department continued to work collaboratively with all City departments and support services. The 2017 budget year was a challenge for all departments in the City, and Fire was no exception. and look of the facility. life and safety of its community and members were met. department continued to work collaboratively with all City the community was built in the 1970s and houses not only a Sioux Falls Fire Rescue is one of only 60 agencies that have departments and support services. The 2017 budget year was a challenge for all departments in the City fire station but a fire maintenance shop used in repairing all both an ISO 1 designation and Accreditation through the Teamwork is was the key toexception. success, and the department continued to work collaboratively with all City working with our and Fire noand With lower-than-expected revenues for the City, SFFR, the departmentâ&#x20AC;&#x2122;s apparatus other equipment necessary Center for Public Safety Excellence. Both achievements departments and support services. The 2017 budget year was a challenge for all departments in the City, operated lowerand than planned for during the 2017 budget to meet theFinance mission. department, This fire facility and parkingunder lot wasa 2017 budget work together require continuous evaluation and selfand Fire was no exception. With lower-than-expected revenues for the City, SFFR, working with our in need of updating and remodeling; a physical training assessment to ensure thethat Cityâ&#x20AC;&#x2122;sprimary Fire Rescue servicesand meet preparation. To meet this, the department prioritized and ensured services programs Finance department, operated under a 2017 budget lower than planned for during the 2017 budget room was added along with other necessary work, such theand highest standards andmet. require Fire to be continually that impact the life safety of its community members were preparation. To meet this,and the department prioritized and ensured that primary services and programs that impact the life and safety of its community and members were met. line emergency equipment, saws, and small engines ready for use on emergency scenes and for day-to-day operations. The Fire EVTs and staff remain an integral part of meeting SFFR’s mission. The office team at Fire Headquarters and Fire Prevention had another busy year in support of the department and its members through customer service, payroll, purchasing, data collection, Quality Assurance, permits, licensing, and clerical support. In 2017, in support of the mission, two older reserve units were refurbished and each given a new chassis, and one command vehicle was replaced. Operations Division In 2017 SFFR responded to 12,830 various emergency situations, lower than 12,932 responses in 2016. (Included in this total were 79 mutual aid responses in surrounding communities.) Major fire responses and loss included fires at 111 East 14th Street ($354,000 property and contents), 2304 South Lake Avenue ($275,000 property and contents), and 3700 South Bahnson Avenue ($254,668 property and contents). The City of Sioux Falls had one fatality fire in 2017. 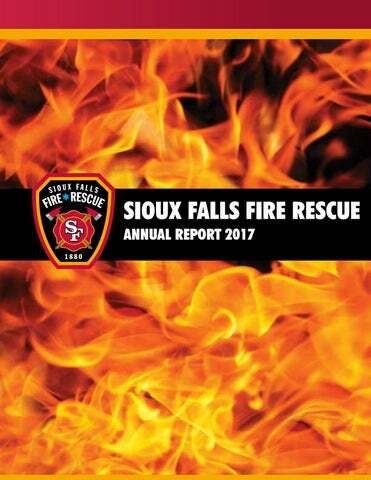 The City Of Sioux Falls incurred $4,090,874 of fire loss in 2017. Fire loss in 2017 was below the national average. $260,189,085 worth of property and contents were exposed to fire. This means that Sioux Falls Fire Rescue saved $256,098,211 of all the property and contents that were exposed to fire. As the growth of the city continues, SFFR now provides services to 183,200 citizens and covers approximately 75 square miles within the city of Sioux Falls. The population of the city grows by an additional 25 percent during the daytime as workers commute into the city. The Operations Division is tasked with emergency response and is responsible for the management of day-to-day activities of the 181 personnel assigned. During 2017, SFFR traveled to 90 percent of all priority 1 or 2 emergencies (lights and sirens) in 4 minutes, 43 seconds. Our 90 percent turnout timeâ&#x20AC;&#x201D;the amount of time that it takes a crew to be paged, put on their firefighting gear and leave the stationâ&#x20AC;&#x201D;was 1 minute, 35 seconds. Keeping low response times is a key component of maintaining our status as an internationally accredited fire department and our ISO rating of 1. The division is divided into two battalions. They are the North Battalion and the South Battalion. Other than the operations division chief, all personnel work a 24-hour schedule. Emergency response included responding to and mitigating medical calls, injury accidents, fire notifications and related incidents, technical rescue, and hazardous material incidents. In addition to standard mutual aid agreements, SFFR has agreements in place with counties for response to Urban Search and Rescue incidents, weapons of mass destruction (WMD) incidents, and hazardous materials incidents in the region. A contract has been signed with the South Dakota Wildland Division to assist with wildland fires and prescribed burns in eastern South Dakota. to all of the suppression personnel on the department. 	Deep Creek Fire near Hayden, Colo.
our fellow citizens in their time of need. 	Chilson Fire near Hot Springs, SD. 	Diamond Creek Fire in northern Wash. 	Mount Jolly Fire near Cle Elum, Wash.
resulting in dollar loss, injury, or fatalities within Sioux Falls. streamline processes, and gain new efficiencies—all in an effort to provide outstanding fire and life safety services to the community. online scheduling for grade school fire safety programs. including operational licensing and recurring inspections. Fire Investigationâ&#x20AC;&#x201D;Fires occurring within the City of Sioux Falls are required by state law and adopted fire code to be investigated for origin and cause. These determinations are necessary to define whether the fire was incendiary, accidental, natural, or undetermined. This determination provides the framework for developing strategies to minimize future fire occurrence and injuries. When a fire is determined to be accidental in origin, investigation results are used to eliminate or reduce future occurrences through fire code revisions and public education programs. If a fire is determined incendiary, investigators work in conjunction with Sioux Falls Police and other investigative agencies to conduct full investigations with the goal of prosecuting those responsible. Engineeringâ&#x20AC;&#x201D;A centerpiece of fire engineering within Sioux Falls Fire Rescue is conducting plans review on infrastructure and fire protection features for new construction and renovations. As the city continues to annex in undeveloped property, key fire code provisions of vehicle access and hydrant layout are reviewed for compliance during the planning process. New structures are reviewed for required fire protection features including fire sprinklers, alarms and special extinguishing systems. Implementing new Land Management software has proven to be a critical asset, as 2016 was the fourth consecutive record year in construction valuations. Implementing new technology continued to be a focus in 2017; online permitting applications, reviews and inspections all move toward becoming a digital process. These enhancements will hopefully bring improved focus to customer service and streamlined processing for future projects. if available. This provides the department with quantifiable performance indicators for self-assessment and quality improvement. Sioux Falls Fire Rescue is one of 12 major organizational units of the City of Sioux Falls. The department is led by the Fire Chief who reports to the Mayor. The department is divided into five divisions: Administration, Operations, Fire Prevention, Professional Standards, and Emergency Management. This report contains sections from each division. In 2017, Sioux Falls had one death from fires, keeping the five-year average to 1.0 compared to the national average of 1.61, and the Midwest region average of 2.47 per 183,200 people. The department had an operating budget of $26,235,832 in 2017 used to provide services in the areas of fire suppression, emergency medical basic life support, technical rescue, hazardous materials mitigation, fire prevention, public education, and maintain 11 fire stations, and 24 response apparatus. The department has 208 personnel assigned to it, with 181 of those working in the operations division. Sioux Falls had 342 fires and fire loss was $4,090,874 in 2017. Our five-year average is $3,828,140. According to national statistics, a city the size of Sioux Falls can expect to have 494 fires and a fire loss of $5,547,766 annually. INSURANCE RATING The Insurance Services Office (ISO) rating is important because it is the basis for property insurance for most insurance companies. It has a direct bearing on insurance costs for our citizens. The rating is based on the fire department, water delivery system, and emergency communications dispatch system. 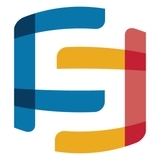 SFFR was designated a rating of 1 on November 2015. 	Training o	Advanced Incident Command System 300 Course o	Advanced Incident Command System 400 Course o	FEMA Basic Public Information Officer Course o	FEMA Liaison Officer Course o	SF Public Schools Reunification Training o	Depart of Homeland Security Active Shooter Response Course o	Pediatric Response Course o	Situation Unit Leader o	Social Media Training o	Storm spotter/severe weather safety training with National Weather Service for 500 attendees. 	Outdoor Warning Sirens: Emergency Management maintains a system of seventy-seven (77) outdoor warning sirens to alert the public in the event of tornadoes threatening the community. studied for its effectiveness throughout 2018.
emergency response for all the members of our organization. with the real winners of the event being the 3,204 patients positively affected by those donations. research and information collection from all aspects. model organization for others to follow. dedication to networking within the fire service. Time Weighted Average (TWA) of exposure limits to outline the duration and levels firefighters are exposed to. This research project will literally save thousands of dollars in preventable hearing loss and days of work missed. training and education to build this group to the next level. cardiovascular endurance and musculoskeletal strength. the Individual Physical Ability Test (IPAT) through the cooperative efforts of the Sioux Falls Firefighters Association, City of Sioux Falls Human Resources and City Attorney, Risk Administration Services (RAS), and South Dakota State University (SDSU). This physical test ensures our current and future members of SFFR are physically fit and capable of handling the extensive physical demands of the career. director of the Illinois Peer Support Team came to Sioux Falls to conduct a two-day training work shop held at SFFR Station 2. This was a monumental experience for the Peer Support Team to kick-start the program for our organization to align with Firefighter Life Safety Initiative 13; Firefighters and their families must have access to counseling and psychological support. Initiative 13 means that firefighters and EMS professionals and their families must have the resources to deal with the various complications that their jobs can bring to their lives, especially issues regarding emotional and psychological stress. They must also have help available to deal with the problems in living that all of us sometimes face, regardless of the work we do, especially regarding family, finances, or even drug and alcohol issues. Health and safety standards (like the NFPA 1500 Standard on Firefighter Health and Safety) require that assistance programs be made available to ensure that such services are there when needed. operate in a capacity that is professional and beneficial to the men and women of Sioux Fall Fire Rescue. NFA course titled Cultural Competence for Risk Reduction. the tragedy they encountered with their team members. and are developing a larger group within South Dakota. The SFFR Fire Chaplain Mission Statement: To give aid, comfort, and help to firefighters and their families, and the community; to work toward the betterment of all areas of the fire and emergency service. SFFR Fire Chaplain Vision Statement: To serve God, to aid humanity, our communities, our government, our religions, our country, and the quality of life. with all aspects of a line-of-duty death—from helping with arrangements for a fire department funeral with full honors to providing emotional support for the family and department members. Throughout the next several years the SD LAST team will continue to build this program.